More than 500 Marshall County students were recognized for their academic accomplishments during the district’s annual Night of Excellence ceremony held last night at the John Marshall High School Center for Performing Arts. Students from McNinch Primary, Cameron Elementary, Center McMechen Elementary, Central Elementary, Glen Dale Elementary, Hilltop Elementary, Sand Hill Elementary and Washington Lands Elementary were celebrated along with Moundsville Middle School, Sherrard Middle School, Cameron High School and John Marshall High School students. 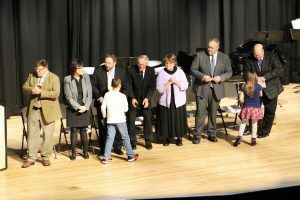 Marshall County Board of Education members, county administration and school principals congratulated each recipient with a handshake and certificate.